Robert Adamson's 80-year-old mother will be delighted by his writer's fellowship. When he missed out last year she asked, "Isn't it time you went back to fishing or cake shops?" For Adamson, one of Australia's finest poets, the $80,000 Literature Board fellowship means he can take a break from writing for Fishing World magazine to focus on poetry and a second volume of autobiography. He has earned $30,000 from the recent first volume, Inside Out, which covers his early life as a bird lover, thief, prisoner, pastry cook and Balmain bohemian. Poetry saved him from the horrors of prison. "It's the first time I've ever made real money from writing. 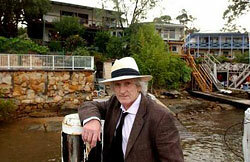 The only money I've made from poetry is prizes," said Adamson, 62. Even when he won three major poetry awards in 1990, "it came to about the average wage". Britain's Times Literary Supplement this month gave a rave review to Inside Out and his poetry book, Reading the River. But great reviews don't create time to write, said Adamson at his house on the Hawkesbury River, where he fishes for bream and poetic inspiration. When his fellowship application failed last year, "I was devastated. I rang the Literature Board and went off my head." Now he can work on a poetry collection commissioned by a Chicago publisher and The Goldfinches of Baghdad, a book of poems with etchings by the artist Gary Shead. His new autobiography will follow the growth of his poetry, his drug-fuelled friendship with Brett Whiteley, the collapse of his first marriage and his alcoholism that ended with marriage to the photographer Juno Gemes. The Literature Board gave a total of $1.93 million to 90 out of 475 applicants in its annual round of funding last week. Grants mean survival for many of our most successful writers. Henry Reynolds, the prominent Tasmanian historian, and Alex Miller, an award-winning author of seven novels, also received $80,000 fellowships - the top level of funding for writers who have "made a significant contribution to Australian literature". English-born Miller, 67, will research and write a novel based on Cullin-la-Ringo, a Queensland station set up by an idealistic family who died in the 1860s war between settlers and Aborigines. Reynolds, 66, will write about racial segregation in Australia from 1901 to 1961. Miller said his fellowship was equivalent to an entry-level wage, and that only Australia and Spain taxed grants and prizes. This article reprinted from the Sydney Morning Herald website.